A visit to Campania is not complete without trying limoncello, the region’s celebrated lemon liqueur. Lemons are one of the classic symbols of the Amalfi Coast and Sorrento, and all along the coastline you’ll spot their bright color on terraced gardens. They also lend their fresh scent and vivid color to limoncello, the strong lemon liqueur made on the Sorrento Peninsula and throughout the Campania region. Often enjoyed after meals in small glasses, limoncello is a particularly refreshing drink on warm summer days. While limoncello can be made with any type of fresh lemons, the magic of Campania’s distinctive limoncello begins with the special variety of lemons that are grown on the Sorrento Peninsula. 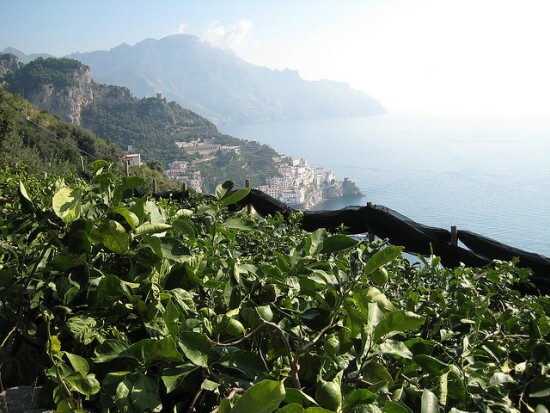 Along the Amalfi Coast you’ll find the Limone Costa d’Amalfi cultivated in steep garden terraces. 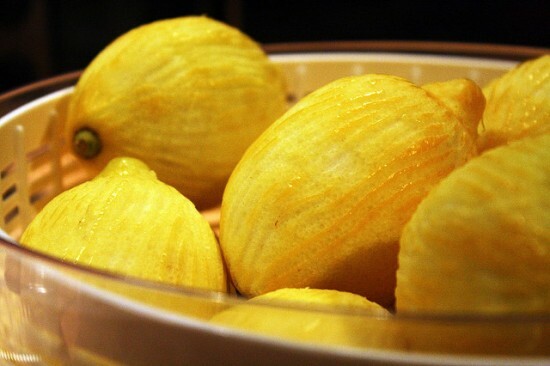 Also called Sfusato Amalfitano, these lemons are known for their tapered shape, intensely scented and thick skin, as well as for having more vitamin C in their juice than other types of lemons. While not far away, the Sorrento coastline is known for Limone di Sorrento, a rounder shaped lemon with highly perfumed skin. 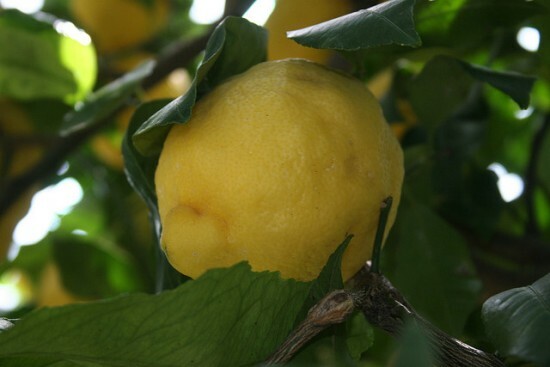 Both the Costa d’Amalfi and Sorrento lemon varieties have gained the IGP (Indicazione Geografica Protetta) status, which marks them as unique regional foods of Campania. The process of making limoncello is quite easy, and many families and restaurants in Campania produce their own. The process begins by choosing the freshest lemons possible, preferable picking them right off the tree. It’s important that the lemons are just ripe, or even a still a little green, because that’s when the skins have the highest level of oils and will make the most flavorful limoncello. Just the peels are removed and then infused in pure alcohol for about a week. The lemon scented alcohol is then blended with a sugar syrup to create the final limoncello. 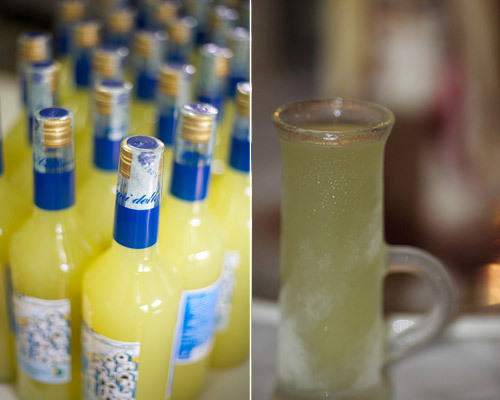 In Campania, limoncello is often served very cold in pretty or decorative glasses. Its high alcohol content means you can store it in the freezer and pour it into frosty glasses that have also been chilled. One of the classic glass shapes is tall and skinny with a little handle to hold while you sip the ice cold, lemony liqueur. 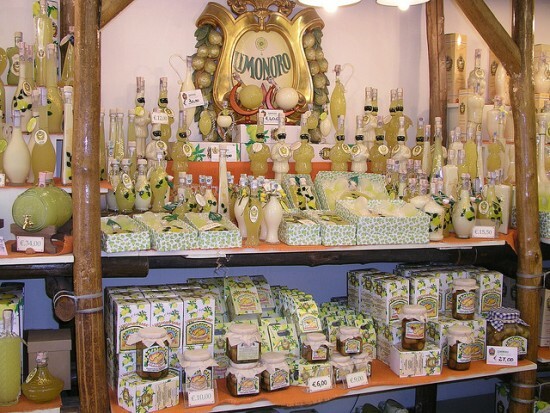 Since limoncello is so strongly connected with Sorrento and the Amalfi Coast, you’ll find many shops selling the liqueur and related products, including candies and a delightful creamy version of limoncello. Many shops will also offer you a sample, so you can taste out the local varieties during your travels until you find the perfect balance of sweetness and the distinctive, tart lemon flavor. For a taste of Campania at home, try making your own limoncello by following these easy steps. Peel the lemons being careful to remove only the zest and not the white pith. Put the lemon zest into a large jar with alcohol and cover. Let sit in a cool spot for about a week. After a week, strain the lemon zest from the alcohol and set aside. Boil water and add the sugar, mixing until it is dissolved but not bringing to a boil. 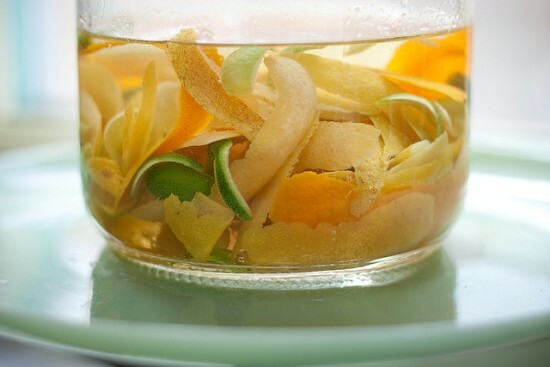 Stir the sugar syrup mixture into the lemon-infused alcohol. Strain into clean, dry bottles. Serve your limoncello cold from the refrigerator or freezer and enjoy! 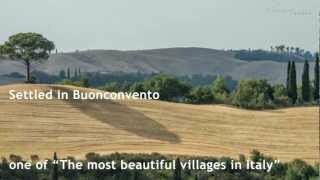 Are you interested by Italian traditions? 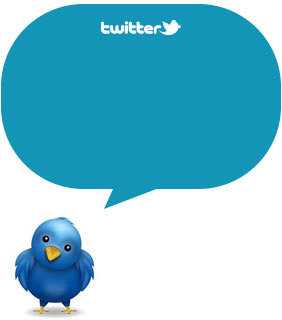 Subscribe to our RSS and follow us on on Twitter and Facebook!! !